25 rds. Remington® HyperSonic SteelTM 12 Gauge Shotgun Ammo. Impressive 2-stage ignition technology safely accelerates your shot to HyperSonic speed. Patented XeleratorTM wad delivers tighter down-range motion, too, for reliable accuracy, time after time. 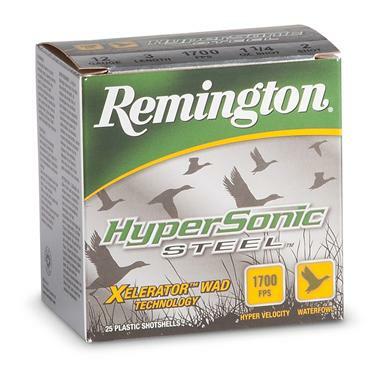 25 rounds Remington 3 HyperSonic Steel 1 1/8-oz. 12 Gauge Shotshells is rated 5.0 out of 5 by 3. Rated 5 out of 5 by WILLIAM from We love it it goes with our cabin d cor!!! Rated 5 out of 5 by JOE from Accurate shot with great pattern. Knocks him down with authority. Rated 5 out of 5 by OWEN from Must be nearing the bottom of the barrel as some of the boxes wee rather worn and torn. THe shells were in fine shape.